Enviro Bug Control introduces the new A-B110 360 degree ultrasonic pest repeller that assists with effective control of common pests in an area of 4000 square feet. 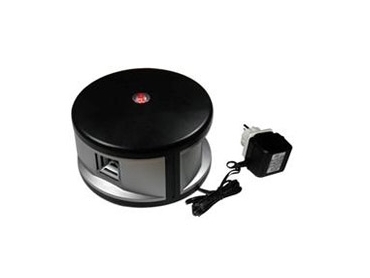 The powerful ultrasonic unit is highly effective in the control of mice, rats, cockroaches and common insect pests. The A-B110 360 degree ultrasonic pest repellers create 140 decibels of sound pressure with the ultrasonic sound waves attacking the auditory and nervous systems of common insect pests and vermin causing them pain and discomfort, and making them give up their source of food, water and shelter. These high-intensity sound waves are safe on humans as well as most household pets. After placing the A-B110 unit, it can take two or more weeks to change the pests’ habits before they move permanently on. The A-B110 360 degree ultrasonic pest repellers can be placed in homes, farm sheds, stables, poultry sheds, vehicle garages and any place with a pest problem. Constructed from quality materials with high manufacturing standards, the pest repellers have proved to be very effective in pest control trials carried out in a broad spectrum of conditions and locations. A-B110 360 degree ultrasonic pest repellers are sold with an exclusive 12-month return and replacement warranty against unit malfunction, excluding physical damage. The pest repellers are available at an affordable price.